I have come to a realization. Are you ready? Swimsuit season is just around the corner, and since I have gotten serious about blogging I’ve put on a wee bit of weight. As a result, I am trying to have smoothies and lean protein for breakfast and big salads for lunch. Last Monday I posted a recipe for a salad that I said was my new favorite salad. You can see that recipe here. I ate it all week and I do love it, but the other day when I was at the grocery store I was drawn to the Raspberries. My mind immediately began putting together different flavor combinations. I hope you like what I came up with. 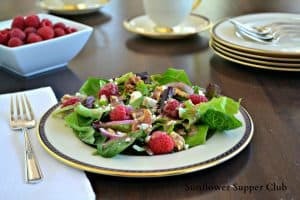 For the dressing combine the 10 raspberries, white wine vinegar, maple syrup, Dijon mustard, tarragon and salt in the bowl of a food processor or blender. Process until the raspberries are pureed. With the processor running slowly pour the oil through the chute until combined. Divide the lettuce between the salad plates. Top with raspberries, blue cheese, red onion and toasted walnuts. Drizzle with the dressing. To toast the walnuts, place on a cookie sheet in a 350 degree oven for 8-10 minutes. I toast my nuts before I chop them, because there is less chance they will burn. Also, when I use red onion in a salad, I soak the slices in ice water for about 15 minutes. It takes away the bite, but you still have the red onion flavor. After soaking just drain on paper towels until read to use in the salad.